Filipino Protesters: ‘Obama Not Welcome’ in the Philippines - Balita Boss! 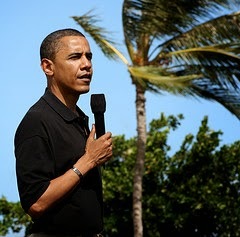 United States President Barack Obama is set to visit the Philippines on Monday, April 28. Filipino groups rally in front of the American Embassy to oppose a visit last Wednesday, April 23 with a message 'Obama Not Welcome' in their placards. However Police armed with truncheons, shields and water hose clashed blocked the flag-waving activists near the heavily fortified embassy compound, but the protesters slipped past them, sparking a brief scuffle in view of motorists stuck in traffic. "Obama's visit is not a symbol of friendship, but signals the US' plan to re-occupy the Philippines. He will meet with his puppet Aquino to push for measures that would further tighten the US' economic, military and all-around control over the country," said Roger Soluta, secretary-general of labor center Kilusang Mayo Uno, one of the groups present at the protest. Philippine National Police (PNP) expects more rally and protests when Obama sets foot in the country on April 28. They will widen the police to guard the streets where activities can happen. The civil disturbance and management teams of the PNP are already preparing for the protests, especially in areas identified as "no rally zones." The visit and the dialogue between the presidents is precisely about Philippine's perspective. Philippine President Benigno Aquino III would like to be able to arrive at a clearer understanding with the US on important aspects of the strategic partnership in our issues and on what Obama considers to be the primary or priority concerns of the government. They will also discuss issues that Philippine is struggling right now with other countries especially between China. “Let us just say that defense and political and security cooperation will be an item in the agenda. And President Aquino will certainly discuss with President Obama concerns of the country that he believes to be our priority concerns and concerns that are aligned to our national interest,” Communications Secretary Sonny Coloma said. The accord will allow more U.S. troops, aircraft and ships to be temporarily stationed in selected Philippine military camps as a counterweight to China and as a standby disaster-response force. About 500 American soldiers have been based in the southern Philippines since 2002 to provide antiterrorism training and intelligence to Filipino troops battling al Qaeda-linked Islamist militants. Still Filipinos hope of a change and a clearer agreement upon the United States of America and Philippines after the visit.